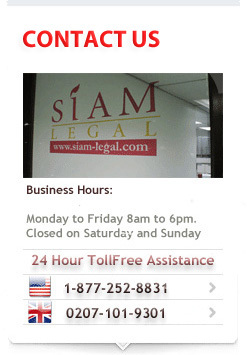 Thailand Property Attorneys in Bangkok Thailand. Pattaya’s property market is one of the most attractive and marketable in Thailand. Amidst the financial crisis and the tsunami incident, it remained strong and even opened new avenues for growth and development. Pattaya’s resiliency to fluctuating economic conditions and its ability to recognize new market frontiers thus explain its appeal to the international developers, investors and consumers. Foreigners are allowed to have freehold ownership of condominiums and condominium units. However, they are not allowed to purchase land although they can own buildings and structures. One common method employed to purchase land is by first setting up a Thai limited company and then buying a piece of real estate in its name. If you are thinking about buying land in Thailand then you need to speak to an attorney. Thai law does not allow a foreigner to own land unless they have invested at least 40 million Baht and have approval from the Minister of the Interior – this will allow you 1 Rai of land for that investment in Thailand. In Thai law there are different types of Title Deeds in use in Thailand. If you are buying a condo or a house ensure that the Title deeds on which the property has been built has the correct title deed if you are wanting to buy the property. Speak to a property attorney first in Thailand before you buy! If you are buying property then you need to know what the property transfer taxes are on the property transfer. This gives you only an indication of what it payable and it is usually settled between the seller and buyer who pays which taxes. Speak to a property attorney in Thailand about the taxes to be paid.